BLOG: When is a 'Strat' not a Strat? 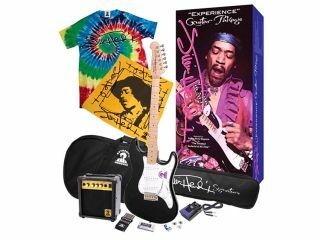 You may have missed this in our Press Release feed, but Gibson has announced a new range of Authentic Hendrix electric guitar packages. Yes, Gibson. The late Jimi Hendrix did indeed play Gibson guitars: a few notable Flying Vs and even flipped-over right-handed Les Pauls, occasionally. So when it was recently announced that Gibson were to launch a series of 'Hendrix-endorsed' Gibsons, MusicRadar assumed it could only be based on one of these iconic designs? This, pictured, is the new Gibson / Authentic Hendrix design. Frankly, MusicRadar is lost for words. This new guitar is apparently "part of preserving his [Jimi's] legacy". Again. Lost for words. MusicRadar has contacted Gibson and Fender for any further statements, but both companies are currently declining to comment. MusicRadar was hoping to speak to Janie Hendrix 22 September, but she had to postpone. Only "an idiot" could confuse? There have been many 'copy' guitars over the years, of course. And sometimes, innovations have come out of that (Ibanez grew from a copy-merchant to a major player in the guitar-making business). What's startling here is... this is Gibson. Gibson is one of the world's longest-established guitar makers. Gibson Guitar, you may recall, sued PRS in the early noughties over the latter's Singlecut design, claiming it breached design copyright. In that drawn-out case, Gibson finally conceded in 2006 that only "an idiot" could confuse a PRS Singlecut with a Gibson. By Gibson's own logic, will only an idiot think this is a Fender Stratocaster, the model of guitar that Jimi Hendrix mostly played? Don't think I'm anti-Gibson. Not at all. I love Gibson guitars. I love their use of fine woods, the roar of humbuckers, the glued-in necks, the neck binding (on some models), the neck profiles, the headstock designs. Fantastic, heritage stuff. Things that few other companies can match. Things that actually say 'brand' and integrity. But everything I - and many others - love about Gibson-made guitars seems to be utterly absent from this 'Authentic Hendrix' instrument, from what I can see. I'm sure it's a decent-enough guitar, but...again, lost for words. Gibson is a great guitar company. Jimi Hendrix is an icon. How the brains behind each legacy has come so-unstuck on this 'authentic' instrument, only time will tell. "If the world's greatest guitarist was still alive today, what guitar would he want to play"? asks the Hendrix estate. Big question, but I'd say if Jimi were alive and played a guitar that LOOKED like this, it would have two important words on the headstock. Not "Jimi Hendrix". But "Fender Stratocaster". One can imagine the conversations among players coming soon.. Player #1: "Check out my new Hendrix guitar!" Player #2:: "Cool, is that a Hendrix Strat?" #1: "Well, err, no - it's an 'Authentic Hendrix' guitar. But it's a Gibson." #2: "But wait, it looks pretty much like a Fender Stratocaster. Like Jimi played, yeah?" #1: "Yeah, kind of. But it's made by Gibson." #2: "Jimi played Flying Vs, sure. But this is a Fender, right?" #1: "No. It's an official Hendrix model. It's just made by Gibson." The world of 'signature' guitars is a rum one, but is this a low? "Authentic Hendrix"? I personally don't think so.